It’s no secret that I adore all things Fall. From the glorious autumn backdrops of nature to the fresh flavors of pumpkin and butternut squash, I savor every moment of my favorite season. The Fall local, in season produce are among my favorites, too. I hope you enjoy the crisp celery, bountiful broccoli and kale, and sweet tasting pears and apples as much as I do. 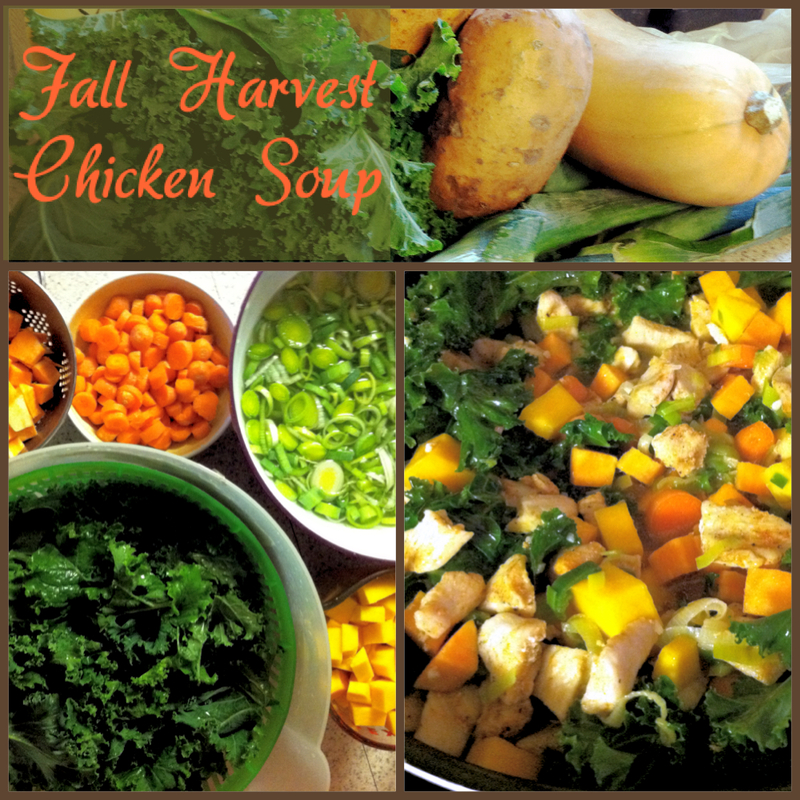 I will be posting many upcoming recipes with local in season foods and this soup has all the flavors and colors just like Autumn. 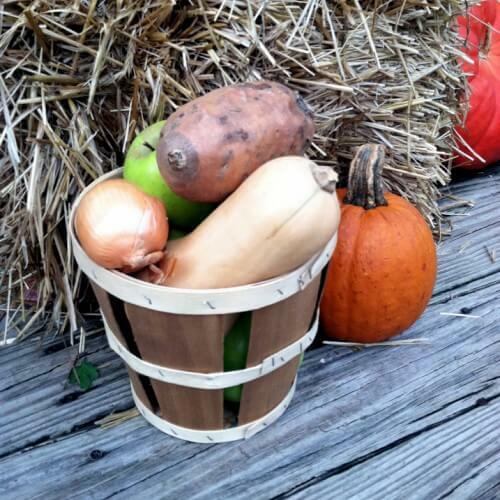 The fall harvest vegetables are plentiful and will warm you inside and out on the perfect fall day! Local, in season Fall fruits and veggies are in abudance now. Support your local farms and buy fresh, local and organic whenever possible. Chop ends off of leeks and slice. Place in a large bowl filled with water. Toss leeks to loosen any dirt. Remove leeks from bowl and place on a towel to dry. Toss chopped chicken with salt, pepper, paprika and nutmeg. Heat a large stock pot over medium-high heat and add 2 tablespoons olive oil. Add in chicken and cook about 2-3 minutes per side or until golden brown. Remove chicken and place in a bowl. Reduce heat to low and add the remaining olive oil. Toss in leeks and cook for 5-6 minutes until soft. Add in garlic and stir, cooking for 1 minute, then toss in carrots, squash, sweet potatoes, torn kale and cooked chicken. Add chicken stock and bring to a boil. Once boiling, reduce to a simmer and cover, cooking for 20-30 minutes, until potatoes and squash are soft but not mushy. Season with additional salt and pepper, if necessary. While the soup is cooking, heat butter in a small saucepan over medium heat, whisking constantly. Stir until brown bits appear on the bottom and then immediately remove from heat. Stir constantly for another 30 seconds. Add the browned butter to the soup and stir. If you eat dairy, feel free to add some freshly grated Parmesan cheese. Enjoy! We made this soup over the weekend and it is our new favorite. I love using the local seasonal vegetables, too and this soup is magnificent. I will make it many times to come. Thank you. We loved this soup! It is going into my Fall rotation! I made this over the weekend and I’m making it again this weekend! It was delicious and perfect for cold and flu season. I love getting all these vegetables in one pot!